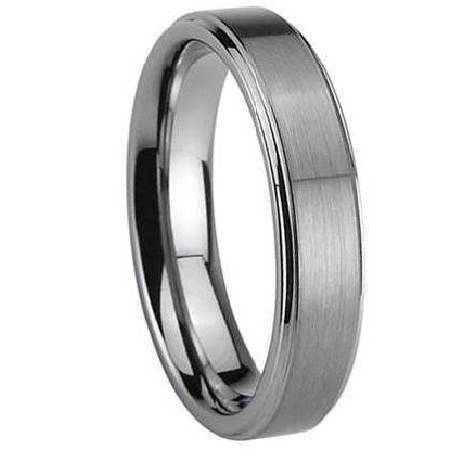 As they say, "skinny is the new strong".Or is it the other way around?Silly catch phrases aside, this tungsten wedding ring, with an attractive slim width, makes for a great alternative wedding band.It's subtle and sleek, with a beautiful satin finish that will win compliments without drawing overwhelming attention.For the guy who wants something simple yet sophisticated, here's your pick. Comfort fit tungsten rings usually run 1/2 size larger, it is suggested you buy a half size smaller than your standard ring size. We recommend having your finger measured for a comfort fit ring at your local jewelry store for an accurate fit. All of our tungsten rings come with a lifetime warranty. This ring is even prettier in person. It is elegant and strong. It is nice enough for being dressed up and yet still good for a blue collar working man. My husband (who doesn't wear jewelry) doesn't even mind having it on, it is narrow enough to not bother him, but still look nice on a big man's hand.